Berlin-based architect professionals, Mullers Bro, have a real treat for us today in the form of a modern white and grey home that merges the traditional with the contemporary. As we explore this home from the outside in, we will see just how simple sophistication can truly be as well as how comfort and style collide. Coco Chanel once famously said, Fashion fades, only style remains the same. Let's go and see what timeless style looks like! 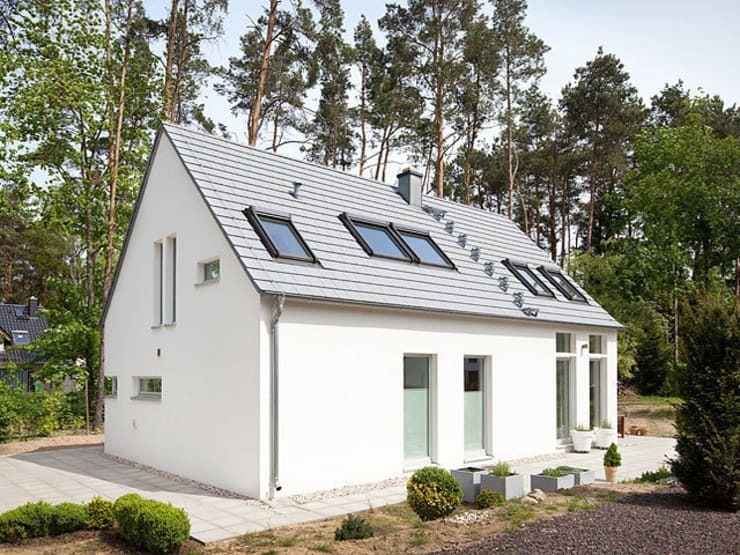 From this angle, we can see how the home is spread over two-storeys, yet looks simple and classic with its gable roof and white and grey tones. The home interior and exterior spaces of the home are strongly connected thanks to large glass windows and doors. There are also skylights inserted in the roof, opening the home up and creating an interior filled with natural light and ventilation. We can also see how the home spills out onto a gorgeous stone tiled terrace, complete with an outdoor dining area. 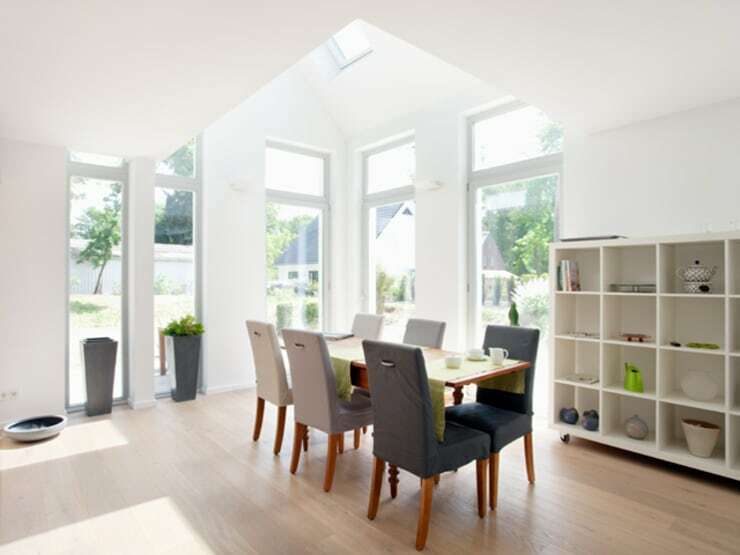 This allows the family an extended living space to enjoy the sunshine and fresh air. If we go around the back of the home, we can see how the white and grey structure contrasts beautifully with the wilderness that surrounds it. Yet at the same time, it integrates perfectly into the setting. Around the immediate vicinity of the house, the garden becomes slightly more tame and organized compared to the woods and trees that we see further on. Here the designers have added potted plants and flower beds, which enhance the facade of the home. This is a great design tip! Have a look at these original and affordable ideas to bring life to your garden. The interior of the home features the same colour palette that we saw throughout the exterior space, including white and grey tones. 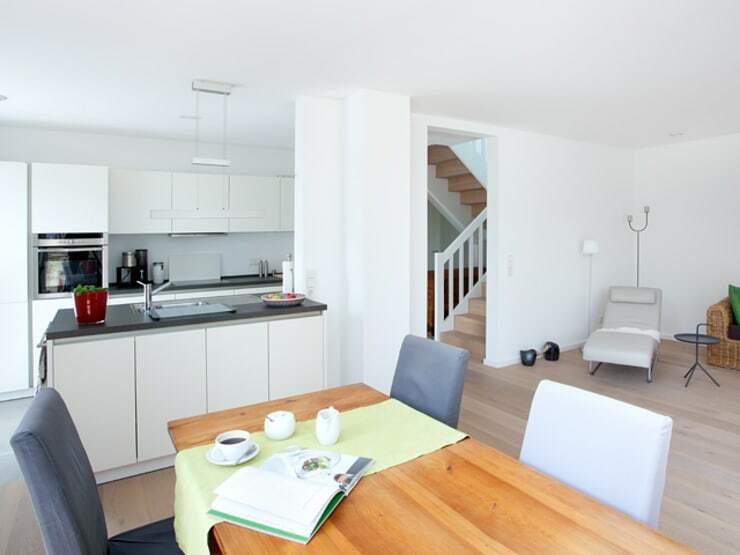 The soft and light wooden floors create a slightly warmer and more cozy home. 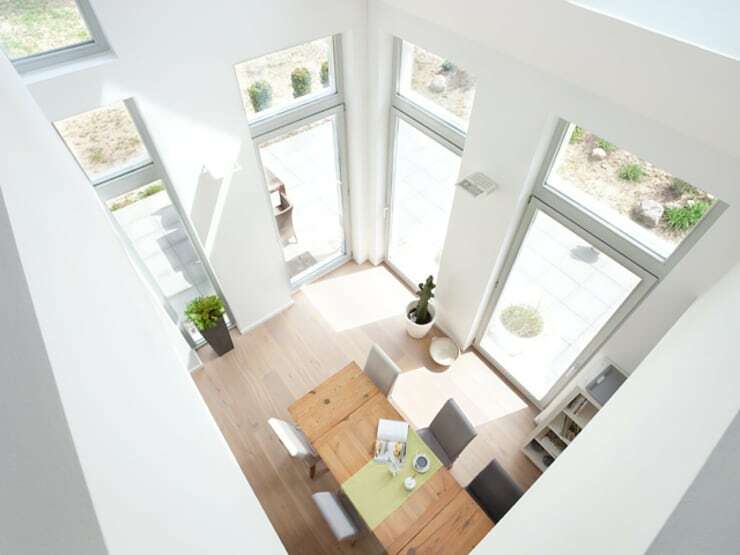 In this image, we really get a sense of how natural light plays a role in the design. The skylights and large glass windows and doors completely open the home up, making for a very light, bright and aesthetically appealing design. The dining room is neat and organised with a wooden table flanked by cozy grey chairs. A bookshelf in the corner creates the ideal space for storing books and accessories neatly away, while still keeping them on display. In this image, we can see how the kitchen, dining room and living room flow into one another, making the home seem that much bigger and more spacious. The connection between the dining room and kitchen is very important, creating a social and interactive home where family members can engage with each other throughout the day. A little kitchen island does bring in that subtle division between the spaces, without cutting off the flow. In this image, we can see what the home looks like when we look down from the second floor. Here we can see how pot plants have been added to the home, breathing new life into it as well as connecting it to nature. Another way to achieve the same results is to add vases of flowers to rooms in the house or even a vertical garden! 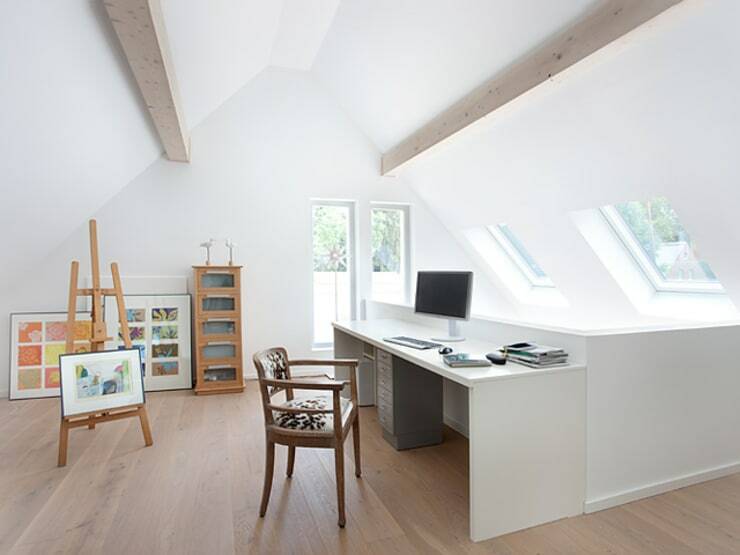 If we head upstairs, we can see that the upstairs loft has been converted into a home office and studio. This is a very functional use of a room like this! So often people end up using it to store old furniture and clothes, which is such a waste of space. The artwork in this area brings a bit of colour and charm to the space, while the desk space provides the perfect spot for the computer, keyboard and work files. With the beautiful sunshine and fresh air flowing through this area of the home, you'd never want to work anywhere else. You'll also notice that is a very neat space, which is thanks to the storage units utilized throughout this home. This keeps anything that isn't functional out of sight – a must for any small home! What do you think of white and grey as dominant tones for a home?